A new report has shown pine martens are starting to re-colonise the south of Scotland after being absent from most of the area for nearly 200 years. The Scottish Natural Heritage (SNH) study, with The Vincent Wildlife Trust (VWT), found them in three areas. The new sites are south and west of Glasgow, the Upper Tweed Valley and Annandale and Eskdalemuir. VWT survey coordinator Lizzie Croose described the discovery of the rare animals as "significant". Pine martens were once found throughout the UK, but suffered a dramatic decline in the 19th century due to woodland clearance, trapping for fur, and predator control by gamekeepers. In the last half of the 20th century, however, populations recovered in Scotland and are now established in most areas north of the Central Belt, including the northern fringes of Glasgow and some other parts of the Central Belt. The species is still rare in the UK and absent from most of England and Wales. In 1988, the species was given full legal protection. Now it has been discovered at the three new sites in southern Scotland after a lengthy absence. A small number of pine martens were re-introduced to the Galloway Forest in the early 1980s, but the new arrivals are not thought to have spread from this group - which has remained in isolation. These new groups of pine martens have most likely originated from "a combination of natural spread and deliberate releases". The information on the pine martens in new areas comes from a recent survey, in which pine marten droppings were collected from woodlands and subjected to DNA analysis to confirm their origin. 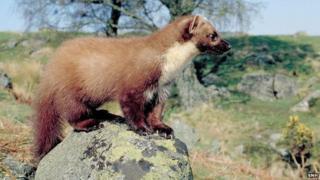 Records of pine martens were also collected from foresters, naturalists and local record centres. Ms Croose said: "The pine marten is the first mammalian predator which almost became extinct in the 19th century to make a substantial recovery in Scotland. "Pine martens have been absent from most of southern Scotland for almost 200 years so their return is significant." Rob Raynor, SNH's mammal advisory officer, said that it was "quite likely" they would re-colonise most suitable habitats in southern Scotland in time. "At present, re-colonisation of the new areas is still at an early stage, but if breeding populations do establish successfully, pine martens will probably expand throughout southern Scotland and south into northern England," he said.